We often talk about offline connections being powered by online networks, but many times it can work the other way around. Earlier this month, a bunch of online KindSpringers decided to have their own in-person gathering. They called it LLOTL -- Lovely Ladies of the Light! Of hearts Reunited in love. Blessings of reuniting, my friends. beautiful thought ...makes the smiles flow right though into the offline world! All thanks to Kind Spring Team for making this wonderful website exist. Thank you "anonymous" gifter of "goodies" for our LLOTL gathering!!! We evolved so much more meeting each other in person. I will never EVER doubt the power of inspiration after meeting this bunch of wonderful ladies! Life has improved 100% and the love and light connections we had will endure forever! So happy to be able to attend the LLOTL meet :)). Pleased that our "leap" of faith into the physical Kind Spring community exceeded all our expectations. Glad all enjoyed poem and photo collage as well :)). Many thanks to our anonymous Kind Spring friends who helped us feel welcome with package of SMILE items. Blessings, my kind friends. As another LLOTL I missed the group gathering. But was fortunate to have Mish all to myself for four days later in October. 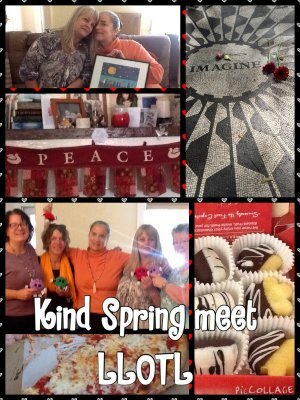 I am so grateful for the friendships and support Kindspring has given me over that last 14 months.